The Intermec PR Series has been discontinued. No direct replacement is available. Fits Your Work Environment for Increased Efficiency and Uptime. Designed for mobile field professionals needing all day comfort and durability in a mobile receipt printer, the lightweight and compact Intermec PR Series is the perfect fit. 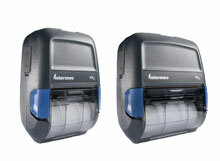 These printers are available in 2" wide or 3" wide versions that deliver a competitive advantage as the fastest, most compact, durable mobile printers with the capability to both print invoices and securely capture payment.